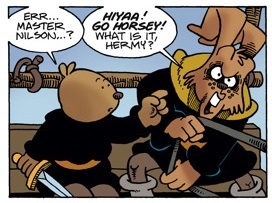 The Nilson Groundthumper and Hermy stories are a funhouse mirror image of the Usagi Yojimbo stories. Both feature rabbit heroes, but where the Usagi stories are set in medieval Japan and are serious and dramatic fantasy, the Nilson stories are set in Dark Ages Europe and are slapstick comedy. 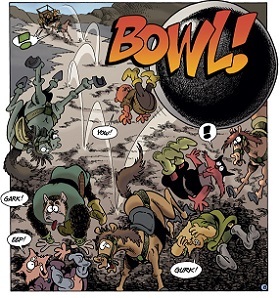 The Nilson series is more reminiscent of Sergio Aragones’ and Mark Evanier’s non-anthropomorphic Groo the Wanderer (which Sakai is also the letterer of, with Tom Luth and Ryan Hill coloring both). Nilson the rabbit is a wannabe warrior-mercenary who, with his follower Hermy, has misadventures with a dragon, an evil sorcerer, an ungrateful king, and the like. It is hard to say which of the two is the stupider. A running gag is confusion over what kind of animal Hermy is. Groundhog? Hamster? Gerbil? Hedgehog? A contest was held to pick Hermy’s species; he’s a guinea pig in the last stories. The final story is an exception to the others. It features Nilson Groundthumper’s and Hermy’s space-age descendants, and the Nilson of the future is NOT stupid. It’s almost too bad. The other eleven stories feel Just Right at 8 to 10 pages – funny bumbling incompetence gets old fast – but the intelligent Nilson seems wasted in a tale this short. Sakai could never team up the two rabbit warriors except in gag portraits of them meeting: the space-age Nilson and Usagi would have made good partners. Usagi was to have been a secondary character in The Nilson Chronicles, a 2,500 page graphic novel, imagined even before the term ‘graphic novel’ was coined. Usagi was to have made his appearance at about page 1,000. (p. 5) I had a glorious death planned for Usagi, and an even more spectacular one for Nilson. Wow! Add this to the list of great comic book adventures never drawn. 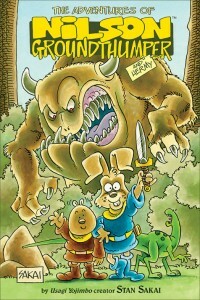 But for the ranks of comic-book funny-animal characters that may have lasted briefly, but are still very funny and worth preserving, here is The Adventures of Nilson Groundthumper and Hermy.